If you've been following along you will know that I have been busy designing knit hats and headbands for the March for Science. I've tried to be as inclusive as possible to the sciences and have designs that represent agricultural science, chemistry, physics, biology, renewable energy, computer science, archaeology and medicine. I hope you enjoy this ebook full of patterns! 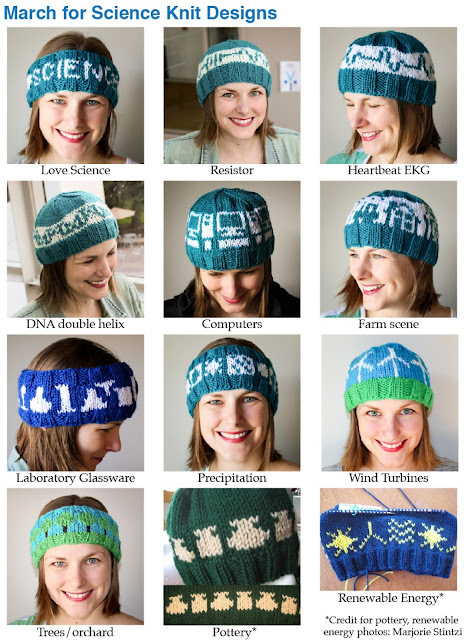 In the next few weeks, I will update the pdf with some science outreach about each of the areas of science represented by each hat. Stay tuned! I am providing these patterns for FREE as I want them to be as accessible as possible. If you appreciate this service and would like to donate to help support Craftimism's knitting and science outreach efforts, please consider giving a few dollars with the donate button on the right panel. Click here for more about Project Thinking Cap and the March for Science. Click here to see the original Resistor Hat post. Click here for a pdf of the March for Science Knit Designs ebook. Excellent idea! Can I buy one of these somewhere? Can't make it to SF and I can not knit. If you're not selling them this would be a great fundraising idea! Also curious about if these are for sale. I can't knit given joint pains, as much as I would love to. I can't be in SF for the march, but I'll be in San Jose for their March For Science that same day. Hi, I am corresponding with some knitters who may make them available on the website weDNA.org - basically the buyer donates a certain amount to a charity and the knitter sends the item to the buyer. I'll keep you posted. I am making and selling some on my Etsy shop (contact me for a custom order), but I will not be able to make any more custom orders in time for the march for science. I loove knowing you are on the planet. You actually make me proud to be human. (I'm not always very proud to be a part of our species.) Thanks for making my day. I would love to buy one too! Any chance of a crocheted version for us non-knitters? The ones I have seen are still in beta, but there are some charts there if you search for "crochet resistor" in that group.